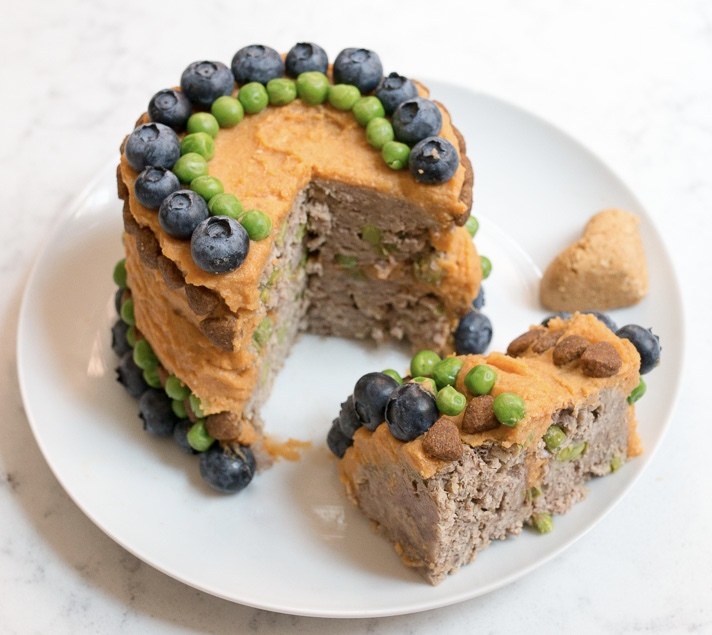 Last week we celebrated Basil's 7th birthday and spoiled every last ounce of him with a homemade meatloaf cake complete with sweet potato frosting and edible toppings. 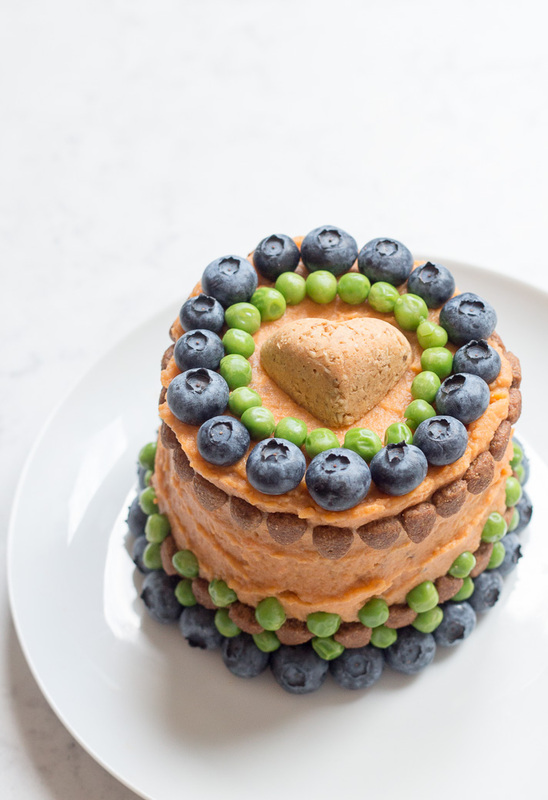 This dog-friendly cake appears perfectly sweet from the outside, yet is made primarily from savory ingredients. It was quite the spectacle! 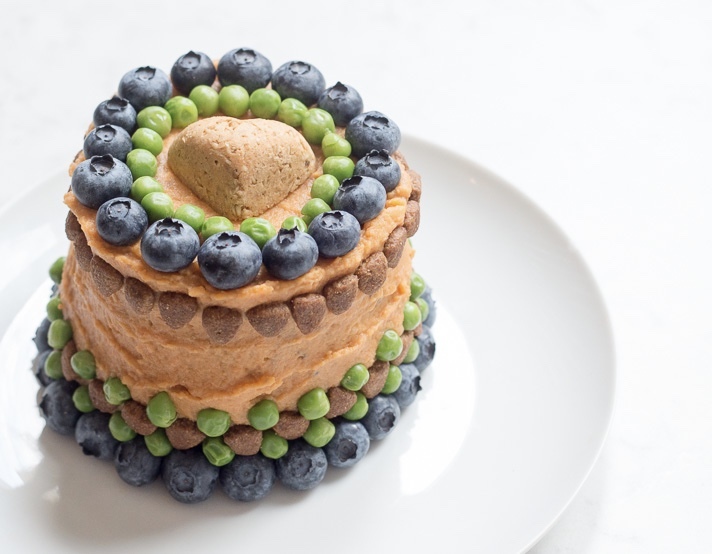 We'd used this meat-based cake recipe from a few years back as the foundation for his cake, changing up a few of the ingredients for a new look and feel. 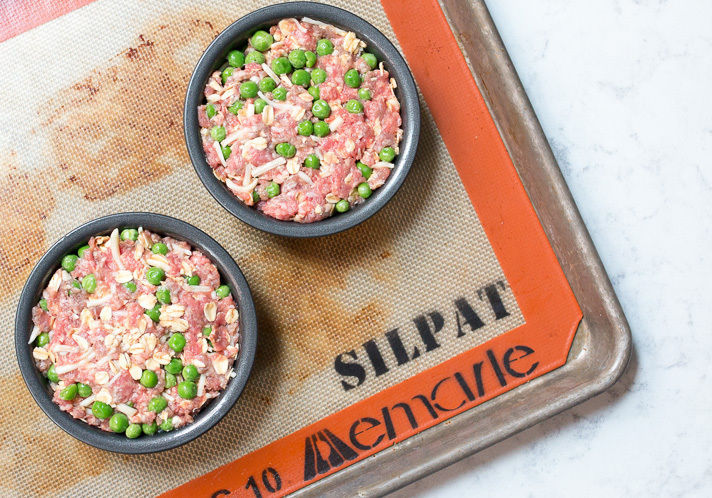 Today we're sharing all the details and updated recipe for each of you looking to spoil your pup. 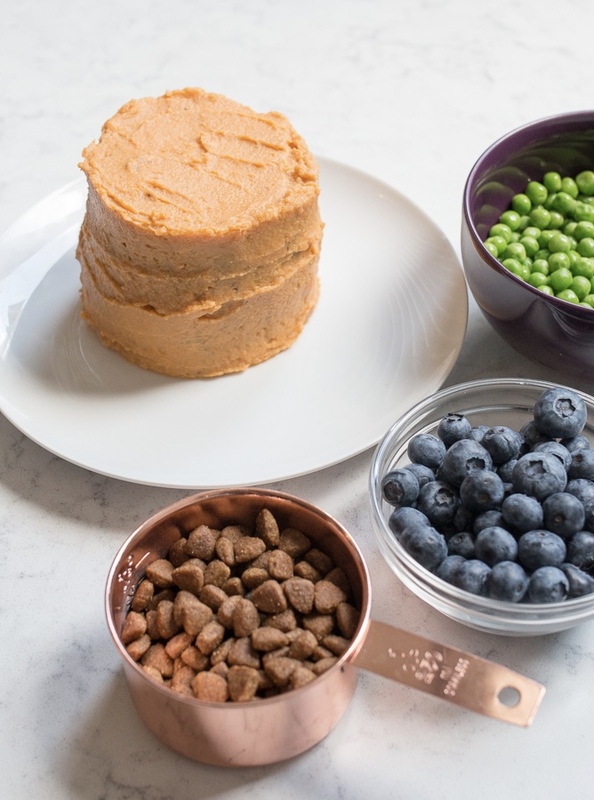 Good to note: Each of the ingredients used to make this cake are categorized as safe for dogs by the AKC. 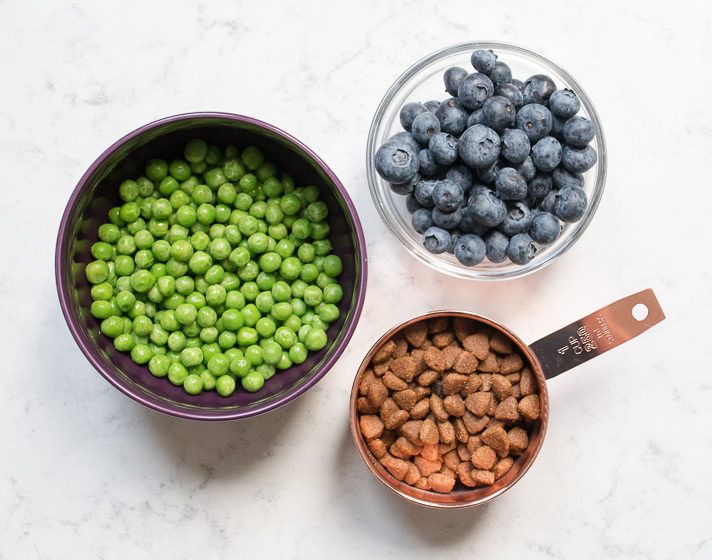 That being said, different dogs react differently to ingredients, so keep a running list of your pup's allergies, avoiding those ingredients when making homemade treats. As with all special treats, it's best to let your pups enjoy while under your supervision. For example, we tend to cut up the slices of cake into smaller pieces since Basil doesn't always thoroughly chew his food. Preheat oven to 350 degrees. Peel and quarter the sweet potato, then cover with cold water in a small pot. Bring water to a boil then reduce heat to medium low, cooking until fork tender, about 20 minutes. 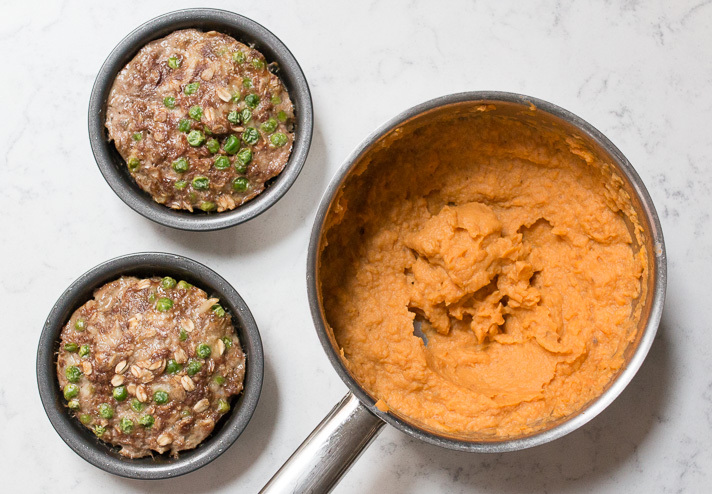 Combine the beef, egg, oats, cheese and 1/2 cup of peas in a mixing bowl (very similar to making meatloaf). Grease the baking tins and divide the mixture between each, pressing down to flatten the surfaces. Bake tins in the oven for 40 minutes or until meat is cooked through. Tip: We use mini round baking tins for a perfectly small cake (like these ). No baking tins? Simply form round patties in the palm of your hand. Meanwhile, drain the potatoes and return to the pot. Slowly add in water, broth or milk by the spoonful while mashing to get a smooth consistency. The whipped potatoes will act as the cake's frosting, so mash to your desired consistency. I used an immersion blender to fully smooth out the lumps. 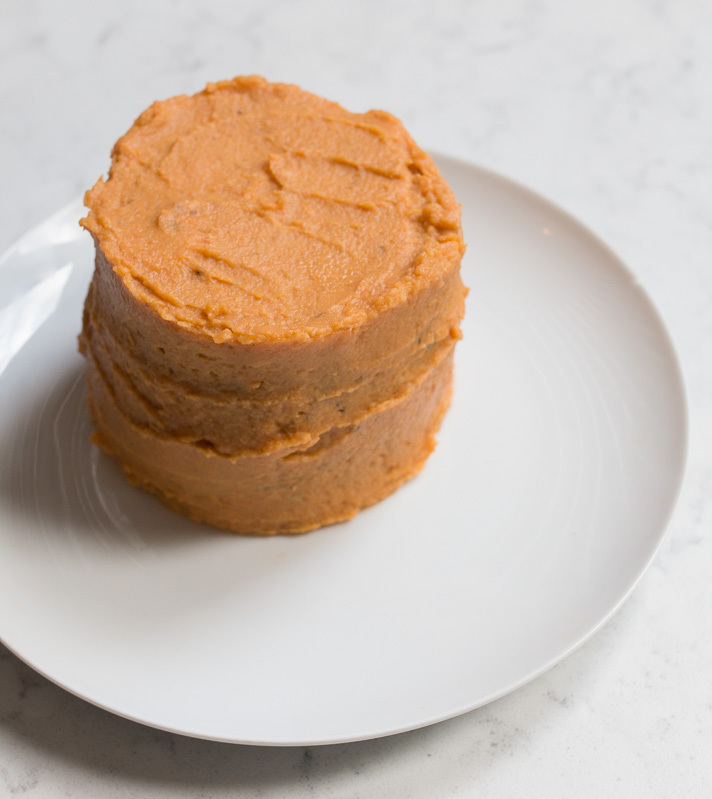 Allow the whipped potatoes and meat patties to cool before assembling the cake (it can get a little messy and cooled ingredients are easier to maneuver). 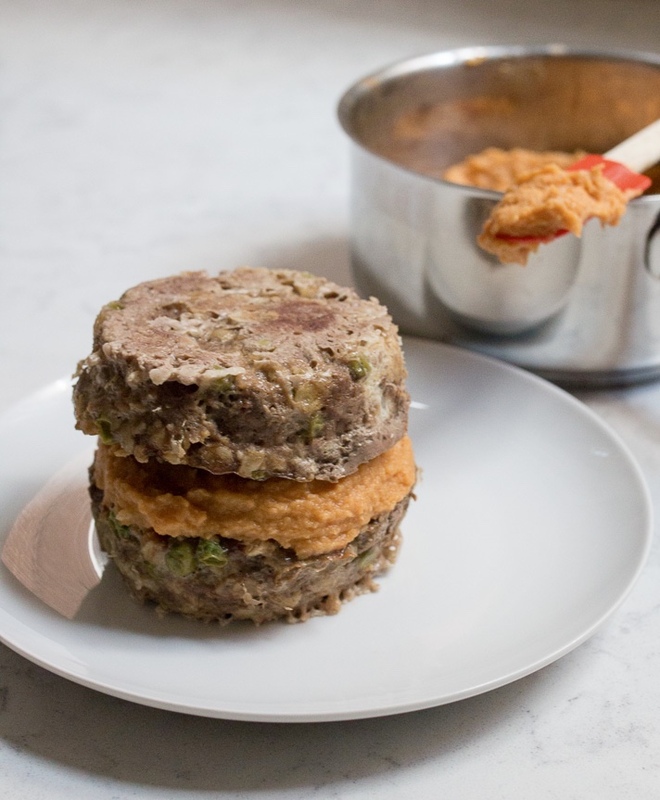 Start by dolloping a healthy layer of potato frosting between the two stacked patties, then generously frost the top and sides of the cake. For a simpler, more natural and rustic look the cake is pretty just as it is now. 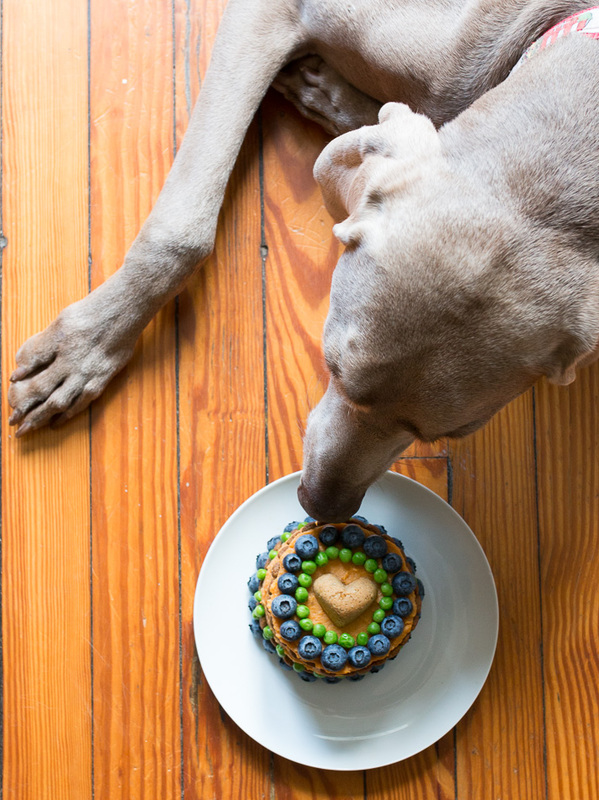 With a dog bone or cookie cake topper, you could call it a day! 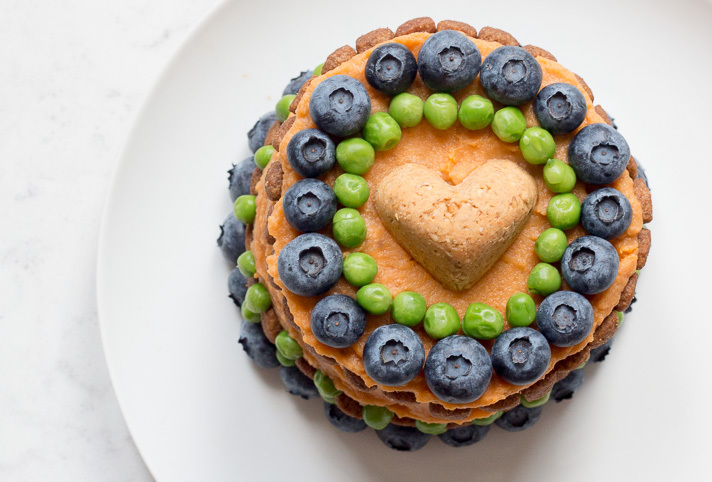 To take it a step further I used blueberries, peas and a handful of Basil's regular dry food to embellish the cake. Blueberries are known for being rich in antioxidants and sweet potatoes, peas and oats are all good natural sources of dietary fiber. Other fun ideas could include cooked baby carrots, green beans, thin apple slices, figs, corn, boiled eggs or sliced bananas. 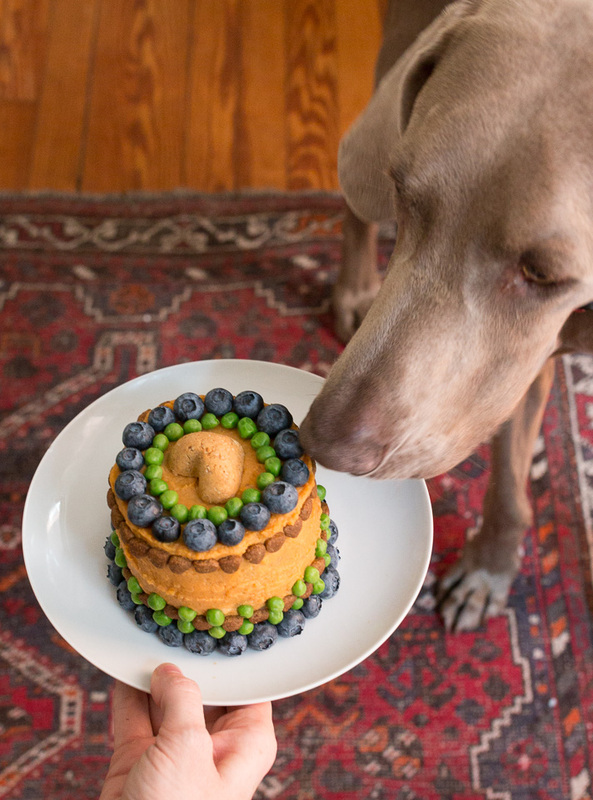 Any dog-friendly human food could be reimagined into decorations or toppers for your personalized "pupcake." To top it all off I used one of Basil's favorite treats — a heart shaped cookie. These are super simple to make and require no baking at all. 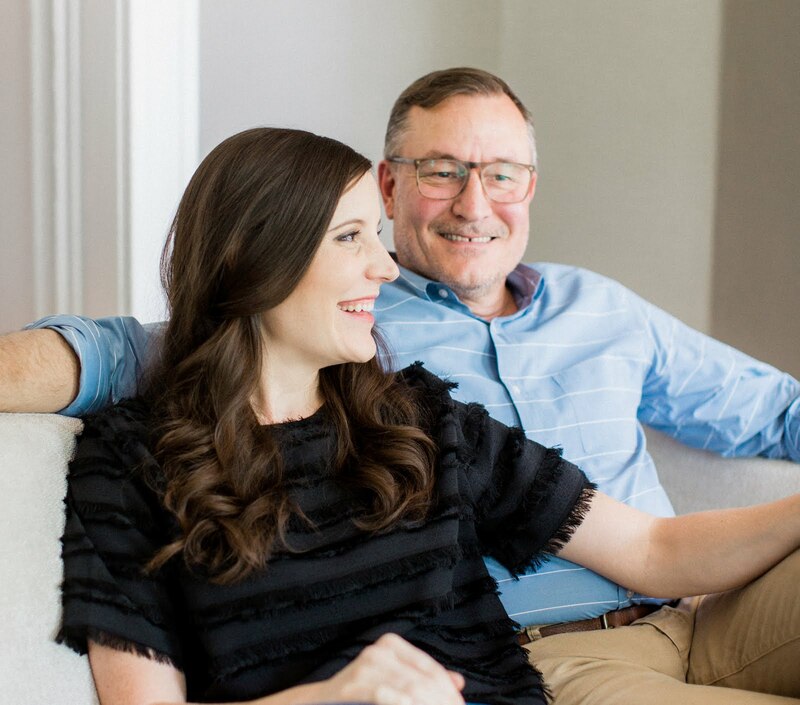 We have the recipe here if you'd like to give them a try. 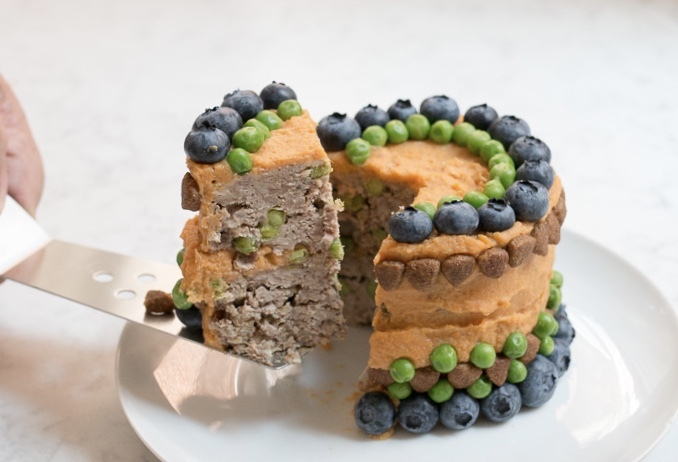 Slicing into the cake reveals its meaty interior, and will make your pup come running! As for the birthday boy— he felt rightly spoiled! Basil got the first slice straight away and we've been using additional slices to supplement his dry meals over the past week. The cake will store well refrigerated in an airtight container for up to a week or frozen for longer periods. 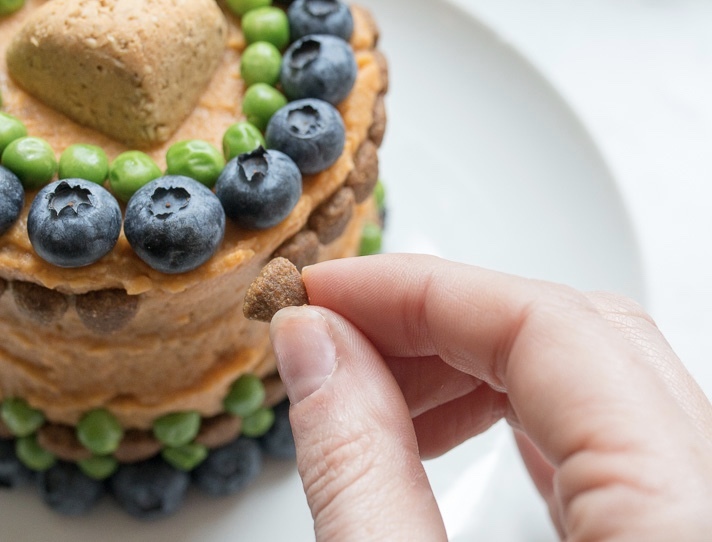 For humans interested in joining the celebration, this cake is made with human-grade ingredients and is just as tasty to share with your four-legged friend on his or her big day!